Ted Poor wants his University of Washington students to understand something: He can teach them a lot, but where they’ll really figure out how to play jazz is on the gig — outside the groves of academe. That’s a refreshing philosophy in an era when school programs have come to dominate jazz. Not surprisingly, Poor’s boss and decadelong musical colleague, jazz division head Cuong Vu, sees jazz the same way. Since Vu came to the university six years ago, he has encouraged students to take off the gown and get out on the town. And they’ve done it, too, bringing some of the most exciting music in Seattle to the Café Racer sessions, Table and Chairs record label events and an improvised music festival they cheekily call ImpFest. ImpFest V gets underway Wednesday with a free clinic on campus with guitarist Bill Frisell, whose official new position as an “affiliate artist” with the jazz division was also announced this week. April is Jazz Appreciation Month, and it’s being celebrated with three jazz festivals around Seattle this month. 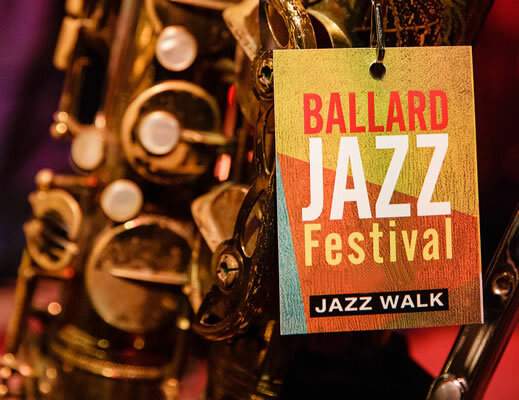 On this week’s Jazz Northwest, April 14, we’ll preview The Ballard Jazz Festival with over 60 musicians performing in various locations around Ballard, April 17-20. Included are The Brotherhood of the Drum, The Guitar Summit, and The Ballard Jazz Walk with a dozen locations featuring many of Seattle’s favorite jazz artists. The Festival concludes with the mainstage event at the Nordic Heritage Museum featuring Gary Bartz with the George Colligan Trio, and the Lew Soloff Quartet. Two more jazz festivals take place the last weekend of April are the Seattle Women in Jazz Festival April 26-28 in various locations, and the UW Improvised Music Festival, April 25-27 at the Chapel Performance Space. The Bellevue Jazz Festival is coming May 20-June 2. Jazz Northwest is produced and hosted by Jim Wilke exclusively for KPLU. It airs and streams every Sunday afternoon at 2 PM PDT, and is available as a streamable podcast following the broadcast. Next week: an Art of Jazz concert from The Seattle Art Museum featuring the Chuck Deardorf-Dave Peterson Group (April 21). Indeed. When he was playing with Gary Bartz a few years back, the famous alto saxophonist suddenly started playing “Witchcraft” on the stand without announcing it. Colligan plays the Ballard Jazz Festival next week, as a leader at several events and as a sideman with Bartz. Hopefully, Colligan won’t have to learn any new tunes on demand. But if he does, the 43-year-old veteran will be up to the task, as those who have seen him here before — particularly at his 2007 Triple Door gig with saxophonist Ravi Coltrane — know full well. Colligan is an emblematic choice for the Ballard fest, in that he represents the event’s hyperlocal-with-a-dash-of-flash values. A teacher as well as a working musician with an international reputation, Colligan is ensconced deeply in the Portland scene and understands that passing the music along to young players is as much a part of the tradition as playing it. The 2013 Ballard Jazz Festival kicks off next Wednesday, April 17, and runs through Saturday night, April 20. Tickets are discounted if you buy in advance through the Ballard Jazz Festival website and there are no service fees attached to the ticket price. Four drummers lead their own groups at Conor Byrne Pub on the opening night of the festival. Scheduled to perform: Sylvia Cuenca, Matt Jorgensen, Sean Lane and Chris Leighton. Guitarists take the stage on night two of the festival as we showcase some of the finest six-string talent from the Northwest and beyond. Scheduled to perform include Tom Guarna (New York), John Stowell (Portland) and Dave Peterson and Danny Godinez (Seattle). Jazz takes over downtown Ballard as we present 21 groups in 12 venues all for a single ticket price. The most recognizable event of the festival brings together all styles of jazz and a New Orleans atmosphere with listeners pouring from club-to-club making this a truly one-of-a-kind event. Also on the jazz festival front … check out the Seattle Women In Jazz Festival (April 26-28) and the Bellevue Jazz Festival (May 29 – June 2). from Earshot Jazz: In this Art of Jazz presentation, bassist Chuck Deardorf and guitarist and composer Dave Peterson, educators at Cornish College for 25 years and major fixtures in the Northwest jazz scene, join colleagues Rich Cole (sax), Bill Anschell (piano) and John Bishop (drums), Thursday, April 11, 5:30pm, at the Seattle Art Museum. “Veteran pals deliver a quintessential mainstream Seattle session: relaxed, light on its feet, gregarious,” Mark Fefer wrote for Seattle Weekly, about sessions following the release of their Origin debut, Portal, with compositions by Dave Peterson. Admission is free. 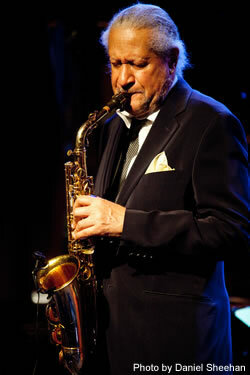 Tickets to headline performances at the 2013 Bellevue Jazz Festival are now on sale. Ticket prices range from $15 to $30; student ticket prices are from $12 to $15. Tickets can be purchased online at bellevuejazz.com. Tickets for Friday and Saturday night performances can also be purchased by phone from Brown Paper Tickets at (800) 838-3006. Headliner performances will be held at the 410-seat Theatre at Meydenbauer Center and at Bake’s Place, a live music and dining venue in downtown Bellevue. The Bellevue Jazz Festival will also celebrate its 6th year with more than 40 free shows by top regional jazz musicians at venues throughout downtown Bellevue. The full festival schedule will be released in May. More information is also available at bellevuejazz.com. The Bellevue Downtown Association (BDA) produces the annual Bellevue Jazz Festival and collaborates on artist selection with Earshot Jazz Executive Director John Gilbreath. Take two imaginative, virtuoso jazz guitarists, blend and mix well and you have the recipe for this unique concert recorded last month at Kirkland Performance Center. Stanley Jordan is a master touch or tap-technique guitarist who has developed a world-wide enthusiastic following since he debuted on the Blue Note label in 1985. Kevin Eubanks is most widely known as the guitarist/leader of The Tonight Show Band and Jay Leno’s sidekick, but he had extensive experience as a jazz guitarist before, and has resumed his solo career since leaving The Tonight Show. Highlights from one of their relatively rare concerts together will be featured on Sunday, April 7 at 2 PM (PDT) on Jazz Northwest on 88.5, KPLU and streamed at kplu.org. Stanley Jordan and Kevin Eubanks both record for Mack Avenue Records and both have recent releases (“Friends” and “The Messenger”) on the label, but have not yet recorded together. They have done a handful of duo concerts and these may lead to a CD project in the future. 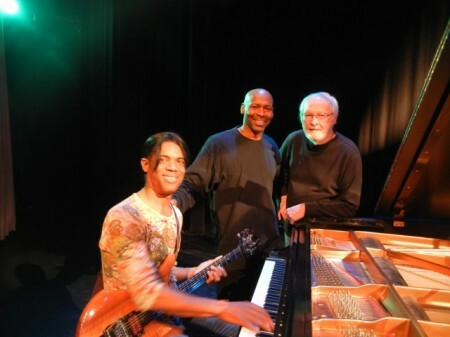 This concert was one of a series of jazz concerts presented by The Kirkland Performance Center during its season. Upcoming are Medeski, Martin & Wood on April 17 and Grace Kelly with Tineke Postma opening on May 11. The Seattle Repertory Jazz Orchestra also plays their next subscription concert at KPC on April 14. Thanks to the musicians, Mack Avenue Records and the Kirkland Performance Center for allowing us to record and broadcast this concert. Jazz Northwest is recorded and produced by Jim Wilke exclusively for 88.5 KPLU and is heard each Sunday at 2 PM. A streamable podcast is available at kplu.org following the broadcast. Seattle Times jazz writer Paul de Barros and radio host Jim Wilke have both been nominated for a 2013 Jazz Journalist Award. Paul de Barros‘ new book, Shall We Play That One Together? 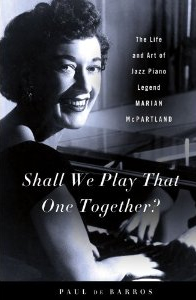 : The Life and Art of Jazz Piano Legend Marian McPartland , was nominated for Best Book About Jazz Of The Year and Jim Wilke, host of Jazz Northwest and Jazz After Hours, received a nomination for the Willis Conover-Marian McPartland Award for Broadcasting in 2012. Doug Ramsey, who now resides in Yakima, received a nomination for Blog of the Year … somehow Seattle Jazz Scene got overlooked again! Ha! For a complete list of of nominees, click here. View all the photos at Eye Shot Jazz.